Do you need help creating a Bibliography or Works Cited page? Click here or on the image on the left to go to NoodleBib MLA Starter. If it is your first time logging in create an account so you can save your work! This web page will link you to the Scholastic Book Fair. It has a list of all the book fair hours as well as a preview of books which will be available, and a way for parents to create a wish list before coming to the book fair. An excellent collection of Encyclopedias, Multimedia, and Periodicals on the California Missions. Also includes more recommended web links. Search by the name of your Califonia mission. See your librarian or teacher for the user name and password! An essay, brief facts about each mission's founding and location, brief information about the photographers, and historic photographs (1895 through the 1940s) of all 21 California missions. From the CaliforniaMuseum of Photography, University of California, Riverside. Brief descriptions of the 21 missions that "comprise California's historic mission trail [and which] are all located on or near Highway 101, which roughly traces El Camino Real (The Royal Road) named in honor of the Spanish monarchy which financed the expeditions into California in the quest for empire." Listed from south (San Diego) to north (Sonoma), making it a handy reference for a road trip. From the California Department of Parks & Recreation. 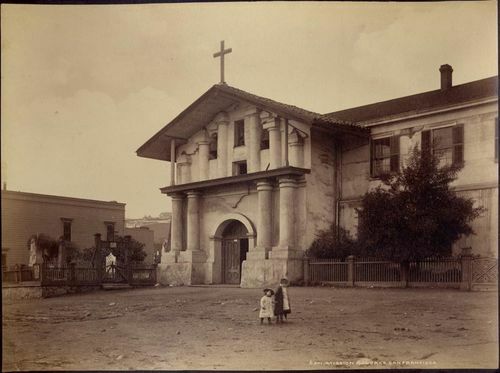 This site has two histories (one brief and one in more depth) of each California mission. There are also historic and contemporary photographs of each mission, sketches of mission life, annotated links to related online resources, and a History of Mission Music with sound clips. A Java script feature is used to define words that might be unfamiliar to elementary school students. Trip reports of two bicyclists' 1995 tour of twelve of the California missions. Photos and interesting details on eleven of them. Take virtual reality tours of many Californian missions. See gardens, cemeteries, adobe walls, courtyards, interiors, and more. The Web site offers no information other than the mission's location and date founded, but the panoramic photography is terrific. Full-text of a 1890 article on the California Missions from the Century Magazine. From the Museum of the City of San Francisco Web site. Find a directory of missions, articles on mission architecture, images of California missions, stories about mission life, and information about archaeological projects. Includes 3-D tours of some of the missions, a glossary, and related links. Searchable. Exhibit of selections from William Henry Jackson's series of albumen photographs (1885-1890) of the Franciscan missions in California. Features images of twelve missions including Mission Dolores in San Francisco, and missions in San Luis Rey, San Juan Capistrano, and Santa Barbara. Includes multiple images of some of the missions. From the Mandeville Special Collections Library, University of California, San Diego. An overview of the history of San Diego from the time of the missions to the present. There are biographical sketches, a timeline, photos, exhibits on the California Pacific and Panama-California Expositions, and the full text of some articles from the Journal of San Diego History . Searchable. A collection of over 4,500 photographs by Will Connell (1920s through the 1950s). Includes photographs commissioned by businesses, images of California missions, and photographs of Hollywood, California, culture. Searchable, and browsable by topic (advertising, animals, architecture, art and photography, education, events, geography, industry, people). From the CaliforniaMuseum of Photography, University of California, Riverside. This project "provides public access to all the information contained in California's historic mission registers. ... Within the baptism, marriage, and burial records of each of the California missions sits ... information on the Indians, soldiers, and settlers of Alta California from 1769 - 1850." Search records by criteria specific to each document, such as parent ethnicity, native name, and Spanish name for baptismal records. Registration (free) required to search. From the Huntington Library. Official website for this California mission, which was the "seventh mission founded [on] November 1, 1776, the Feast of All Saints, by Fr. Junipero Serra." Features history, photos, a mission map and guide, and details about the "Return of the Swallows" celebration that takes place on March 19 (St. Joseph's Day) each year. Also includes a calendar of events, details about preservation, and related material. A research guide on the Spanish missions in California, and more from Scholastic. Much of the material is also available through Grolier Online - see the first link. Brief histories on the missions of California. An excellent collection of Encyclopedias, Multimedia, and Periodicals on the California Gold Rush. Also includes more recommended web links. The legacy of the gold rush era is toxic pollution in California mines and waterways. New Record set for a trip from New York to San Francisco around the Great Horn. Great Hook for the Great Horn Spoon by Sid Fleishman. N. A. Chandler Gold Rush Era Letters collection consists of fifty-six handwritten letters from 1855 to 1872. Dramatic performances of great California writing. California Legacy Project, Santa Clara University. Interactive exhibits and "Sound Movies" on "The Journey", "San Francisco" and "The Diggings". Plus some excellent resources to accompany the book by Sid Fleischman. This site presents a virtual tour of the Oakland Museum of California's Gold Rush exhibition, including sections on art, natives and immigrants, a quiz, and curriculum materials for educators. The exhibit includes photographs, artifacts, primary documents, audio files (some in Chinese), and maps. A few selective Web resources and an extensive print bibliography, browsable by source and alphabetically, about San Francisco in the late 1840s through the 1850s and beyond. Includes links to articles about ships buried in landfill, and a local history treatise about a "Californio" family: "To Have But Not to Hold: The Bernals of Early San Francisco and Their Lost Corner of the City." From Greg Pabst, an MA candidate in history and local history buff. This online exhibit contains many of the materials available in the California Gold Rush exhibit at the Huntington Library and ArtGallery in San Marino, California. The items include original documents and diaries, illustrations, maps, letters, rare books, and photographs. Each item is interpreted in detail, and translated when needed. This is an excellent online resource for students of the Gold Rush; the exhibit was at the Huntington until September 10, 2000. Lesson plan and links to related sites for a classroom activity inspired by the discovery of gold in California in January 1848 and the ensuing Gold Rush. The lesson plan invites students to read Gold Rush letters and write fictional letters of their own. From the International Reading Association (IRA) and National Council of Teachers of English (NCTE). Compilation of stories and related material to honor the sesquicentennial of the discovery of gold in northern California in 1848. Includes information about how gold was discovered, maps about how miners traveled to California by land and sea, details about life in mining camps, some types of people during the Gold Rush era (such as Latinos, black miners, Chinese workers, and women), the legacy of the Gold Rush, and more. From The Sacramento Bee. Maps, letters, books, and other resources from the archives of the California State Library are used to provide an outline of California history during the Gold Rush. Each item is described in detail with both small and large images of the original. Geared for classroom use, this site gives brief commentaries on various aspects of the California Gold Rush. It starts with the 1840s and ends with how the mindset of early entrepreneurs shaped California. Features fun facts for children and classroom resources. History of the California Gold Rush, including a chronology beginning when Swiss-born John Sutter arrived in the California territory and covering the 1848 discovery of gold by James Marshall and California's admission to the United States in 1850. Features information about towns, mines and mining camps, people, the Pony Express, and more. From a company in the gold country that created a website for El Dorado County, California. This travel and tourism site for the towns along California Highway 49 includes historical background about California's Gold Country where "James Marshall discovered Gold in California at Sutter's Mill in [January] 1848 and set off the largest gold rush in history." Includes a business directory, city directory, and maps of the area and of individual cities such as NevadaCity, GrassValley, and Coloma (location of Sutter's Mill). Explores "how the California gold rush of l849 attracted the global community to Nevada County, California." Features information on notable people of the area (Nisenans, Chinese, women); hydraulic and placer mining; trains; and more. Includes timelines. From the DeerCreekSchool, located in Nevada City, California. California As I Saw It: First-Person Narratives of California's Early Years, 1849-1900This site "consists of the full texts and illustrations of 190 works documenting the formative era of California's history through eyewitness accounts. The collection covers the dramatic decades between the Gold Rush and the turn of the twentieth century." Searchable and browsable. From the American Memory Project, Library of Congress. Collection of articles about a "month-long trek [in 1998] across the West retracing the steps of the emigrants along the GoldRushTrail." Features maps, photos, and stories about the overland trail to California and the trails used by miners following the January 1848 discovery of gold at Sutter's Mill in California. From the website for the San Francisco Chronicle. Directory of resources for genealogical research in California. See the California Pioneer List for "settlers to California who migrated to or were born in California prior to 1880 (included in the 1880 California Census ...)." Lists county information; libraries and databases; historical and genealogical societies; pioneer, trail, and California Gold Rush Web sites; a bibliography of diaries and journals; and much more. Aimed at children, this site offers "information about this fascinating moment in American history, looking at Californios, the Spanish-speaking community that had been in California since the mid-1700s; the various routes Forty-Niners took to reach the gold fields, with mixed success; and the overall history of the Gold Rush." Includes a guide for teachers and parents. From PBS Kids. Audio of seven one-hour lectures on California history topics: California missions, the California Gold Rush, Mark Twain, water delivery systems, Henry J. Kaiser, Governor Hiram Johnson, and the history of the Bancroft Library. The lectures, moderated by the Director of the Bancroft Library, Dr. Charles Faulhaber, were recorded live in the Bancroft and originally broadcast in 2002 and 2003. From the Bancroft Library, University of California, Berkeley. Homework and curriculum resources for students and teachers of California history. The site features documents and photographs contained in the California State Archives presented alongside thematically arranged collections of Internet links. Sample topics include the California Gold Rush, hydraulic mining, the 1906 San Francisco earthquake, the Progressive era, and the Great Depression. Also includes lesson plans. Searchable and browsable by topic. From the California Secretary of State. This collection of nearly 1,500 pictures from a photographic publishing company, "used for the selection of prints by its customers, is ... 'without doubt the finest single pictorial record of the maturation of Northern California and the Pacific Coast following the rambunctious days of the Gold Rush and statehood.'" Includes images of the states of California and Nevada, San Francisco and Sacramento, mining, buildings, landscapes, and Native Americans. From the Society of California Pioneers. Website of an archive devoted to Santa Cruz, California, entrepreneur F.A. Hihn and Charles Bruce Younger Sr., Hihn's attorney. "A German immigrant to California's Gold Rush, F.A. Hihn is considered by many as the County's most influential entrepreneur, from arrival in Santa Cruz (1851) to his death (1913)." Contains biographies and family trees, photos, and material about correspondence files. From the University Library, University of California, Santa Cruz. Brief illustrated essays and associated education materials about California history through the mid-18th century. Topics include native Californians, missions and ranchos, and the California Gold Rush and statehood. Also includes links to online activities such as exploring life on a 17th century Spanish galleon, and learning about the use of cattle brands and the meaning of the state seal. (The rock art activity is not available.) From the NaturalHistoryMuseum of Los AngelesCounty. UC Berkeley Library Digital CollectionsA searchable and browsable guide to the digital collections of the UC Berkeley libraries. Subjects include agriculture, architecture, business and industry, the Gold Rush, Chinese communities, social movements, the 1906 earthquake, and California places such as Berkeley, San Francisco, Los Angeles, and Yosemite. Browsable formats include maps, stereographs, photographs, and oral histories. From the University of California, Berkeley, Library. "Approximately 440 cased photographs and related images from the collections of The Bancroft Library. Included are daguerreotypes, ambrotypes, and tintypes dating from the 1840s through 1860s. Also present are some painted miniature portraits as well as other photographic processes such as opalotypes, pannotypes, and crystoleum prints." Features portraits, mining scenes, California gold rush towns, and views of San Francisco and Sacramento. Also contains a glossary of photographic terms, and bibliography. From the California Digital Library. The CWAC is an "effort by organizations throughout California to heighten public awareness of water and the role water agencies and allied entities play in conservation, management, water supply, water quality and distribution. The campaign focuses on the month of May each year with the observance of Water Awareness Month." Site features lesson plans (such as on water usage during the Gold Rush), interactive activities, and water saving tips for homes and businesses. Companion to a Public Broadcasting Service (PBS) American Experience program that "tracks the evolution of the [California] Gold Rush from the easy riches of the first few months to the fierce competition for a few good claims." Features a map with major "strikes," timeline, background about people (such as Mexicans and Chinese immigrants) and events, a special feature on Native Americans, and an online role playing game. Also includes a teacher's guide. A brief history of the former gold-rush town, a map, and a good photo tour with brief notes for each structure photographed. This annotated bibliography describes materials from the collection of the Sacramento Room, Sacramento Public Library. It includes categories for physicians, hospitals, diseases, health care organizations, and other topics related to health and medicine during the Gold Rush. From librarian Judith Welsh. "Over 150 years ago, Henry Wells and William G. Fargo founded a company [in San Francisco] that has become a legendary part of America," known for its banking operations and its stagecoaches. The site features a FAQ, company history (including information about Wells Fargo and black, women's, Hispanic, and veteran's history), information about stagecoaches and stagecoach travel, and about various Wells Fargo museums in California and other states. The history of ships reaching and leaving San Francisco is presented with newspaper articles, letters, advertisements, passenger quotes, statistics, poetry, and illustrations. There are sketches of travel conditions, migration, commerce, the gold rush, and cultures. Vessels are listed, often with detailed descriptions. Captains provides biographies of "Masters under God" who sailed into San Francisco. Other categories cover foreign ports, shipping paths, passenger lists, ship nationalities and cargos, VIPs, gossip, and tall tales. An excellent collection of Encyclopedias, Multimedia, and Periodicals on the Ancient World. See your librarian or teacher for the user name and password! Covers Greece, Rome, Egypt, India, and Mesopotamia. A vast collection of interactive content and multimedia. Note the left menu links to more Interactive Content and History for Kids. Designed for elementary or middle school students and teachers, this site provides basic background information about ancient Greek life. Includes lesson plans, classroom activities, and annotated links. Created and maintained by two teachers. The goal of this ancient history resource "is to provide and organize texts for use in classroom situations. Links to the larger online collections are provided for those who want to explore further." Browse topics such as human origins, Mesopotamia, the Hellenistic world, Greece, Rome, and late antiquity. Edited by a historian. Developed as an on-line course supplement for students and teachers of the ancient Near East, India, Egypt, China, Greece, Rome, the early Islamic world, and medieval Europe with essays, chronologies and primary texts. Search for related essays, images, electronic texts, Internet sites and a space-time, cross-cultural chronology. "This is an educational website which is dedicated to art history. Timelines presents selected resources (web links) about the art and archaeology of ancient civilizations, including: Egypt, Greece and Rome, Asia, and the Middle East. ... Timelines pages are organized by civilization and period." Many of the linked sites include images. From an art history enthusiast. Provides basic information and links for the ancient civilizations of Egypt, Greece, Rome, India, China, and the Pacific Northwest Coastal Indians, with an additional section on EarlyMan. The information is suitable for elementary students, and there are lesson plans and classroom activities for teachers. Created by two social studies teachers. This site includes "well over 1000 pages of news, information, games and controversy about the life, literature, art and archaeology of the ancient world of Greece and Rome, and the latest on my Greek Harry Potter." Your questions on the classics, Latin, Greek, or the ancient world can be answered by the Oracle of Loxias (in the guise of the site author). Topics include classic authors and their works, Greek vase painting and sculpture, women, technology, and links to other classical sites for teachers and a bookshop. "An interactive guide to the Ancient Art Collection of The Art Institute of Chicago" that focuses on the three cultures of the ancient Mediterranean: Italy, Egypt, and Greece. Eighteen objects are featured, each with close-up views and related stories in audio. There are also a timeline, glossary which comes with an audio pronunciation guide, maps, and lesson plans for grades 4 through 12. Also available in Spanish, except for the audio files and lesson plans. A history of early athletic competitions and the Olympic Games from prehistory (ancient Egypt, Mesopotamia, Crete, and Greece) through its revival in the 19th century. Includes descriptions and rules of the early athletic contests, a history of attempts to revive the Olympics, excerpts of interviews with historians, a bibliography, and a glossary. Also available in Greek. From the Foundation of the Hellenic World (FHW). Comprehensive guide to myths of Greece, containing sections on major events in Greek mythology; individual entries for divine, mortal, and semi-divine characters; genealogical tables; maps; a bibliography of ancient and modern sources; and an extensive set of links to sites of Classical interest. The content for this site is mainly based on the book Genealogical Guide to Greek mythology by Carlos Parada, published in 1993. This site designed for children age 6 to 12 provides animated stories and games about "the characters of classical [Greek] mythology [who] occupy three realms: the gods live on Olympus, the mortals (and monsters) occupy the Earthly Realm and the dead live in the Underworld." Also includes craft instructions, searchable and browsable information about characters in the myths, brief essays on ancient Greece, and an interactive Delphic Oracle feature. This site presents an introduction to ancient Greek history, culture, politics, art, and warfare. There is a detailed timeline covering 1200 B.C. to 337 B.C. The Greeks Interactive contains an interactive map, information about life in Athens, and ancient Greek language lessons. The Acropolis Experience includes a film clip about the Parthenon. Use the site index for easier navigation. Educational resources are also included. This "evolving digital library" is diverse, covering the Greco-Roman world, Renaissance literature, history and topography of London, American expansionism, and British scientist Robert Boyle. The site provides reference works such as encyclopedias, grammars, and dictionaries as well as primary sources such as original texts, images, first-person narratives, and diaries. The Perseus Project is located in the Department of Classics at TuftsUniversity. A collection of virtual reality tours of many Greek ruins, including the Acropolis, Delphi, Olympia, and Troy. Movies allow users to virtually walk through these archeological sites; each has a link to more information and some have floor plans of the ruins. Designed by a classics professor at the University of Texas at Austin. A survey of medicine from early Greece through Byzantine times. Among the topics covered are women (both as healers and patients), military medicine, cults, Hippocrates, and Galen. Illustrated with classic art works. From the Claude Moore Health Sciences Library, University of Virginia. Overview of the history of Greece from earliest times to the modern day. Time periods include the Stone Age, Bronze Age, Archaic period, Classical period, Roman period, Byzantine period, Ottoman period, rise of the Hellenic state, and contemporary (1945-2000) Greece. Includes image galleries, bibliographies, and related material. In English and Greek. From the Foundation of the Hellenic World. This site consists of four sections with information culled from books on classical Greece and Rome. "MythNET" provides information about Greek gods and heroes and includes genealogical tables. "Rome Unleashed" provides information about Roman history and includes timelines and tables of rulers. "Rome Exposed" includes information about Roman life such as slavery, attire, and cuisine. "Latin Wordstock" features a Latin to English dictionary and a list of English derivatives from Latin. Searchable. Introductory material designed for children about the history and culture of Europe, Asia, and Africa before 1500. Topics include North America, China, India, west Asia, Greece, Egypt, Africa, Rome, Islam, Germany, and the Middle Ages. Also includes materials for teachers. Kidipede began as a "community service learning project" and is organized and run by a history professor at PortlandStateUniversity. A collection of projects presenting events that shaped Greek society, politics, economy, and culture from prehistory to modern times; "every aspect of city life"; the history and revival of the Olympic Games; and the evolution of democracy in city-states. Searchable. Archaeological exhibits created with computer modeling technology "based on measurements, facts, interpretations, and reconstructions published in authoritative excavation reports and surveys." Reconstructions represent the Acropolis of Athens, the Pyramid Complex of Senwosret I at Lisht, the Pyramid Complex of Senwosret III at Dahsur, and Delight of Re: Solar Temple of Nuiserre at Abu Ghurab. From a nonprofit organization "dedicated to the development and free distribution of computer-generated archaeological reconstructions." This site is a companion to a Public Broadcasting Corporation (PBS) series that traveled to the countries that formed the empire created by Alexander the Great. The site features a description of the journey, a FAQ, a brief biography of Alexander, a teacher's guide, a bibliography, and links to related sites. This site looks at the heritage of Greek culture. Included are museums, monuments, and archaeological sites; modern cultural creations, including literature and books, music, theater, dance, cinema, plastic arts, and photography; and links to cultural organizations. "Special Issues" includes a history of the Olympic Games. Also available in Greek. A directory of annotated links to general archaeological and historical resources, texts, projects, journals, bibliographies, field projects, atlases, museum collections, associations, and more. From a classics professor.